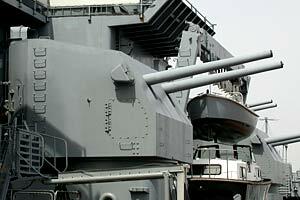 You can visit the Battleship USS New Jersey in Camden, NJ right across the Delaware river from Philadelphia. When I visited in May of 2006 our guide was included in the museum admission price. If you are interested in getting good exterior photos, go early in the morning (the museum opens at 9:00am). The battleship is really quite striking at that time with the early morning light and much bigger in person than you'd imagine. When you walk out of the parking garage and get your first good view of the ship from the shoreline walkway you'll say "Wow!" I arrived at 9am, and our guide said that was the best time to get there. There were only 2 other people in our tour on that spring morning. I can't speak for all the guides but ours gave us a good 2 hours of his time. And these guys are all volunteers. 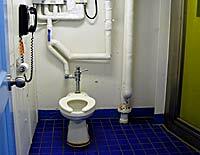 The interior compartments of the USS New Jersey that are currently open to the public have been restored to a very high standard. The bridge and surrounding compartments were freshly painted and it was apparent the staff and volunteers had done a good deal of work to get as much of the original equipment in place as possible and looking good. I especially liked the crew's artwork. Keep an eye open as you make your way around the ship for them. 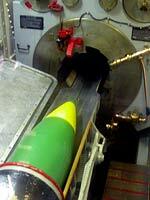 My favorites were located in the main sixteen inch turret that is open to the public. There's a bit of climbing and ducking to get in, but it's worth the effort. Our tour guide Dave was not a USS New Jersey veteran, but he was a WWII Marine veteran, and knew this Iowa Class Battleship well. One story that Dave told us was of the blast damage to a maintenance shack on the stern deck of the ship. 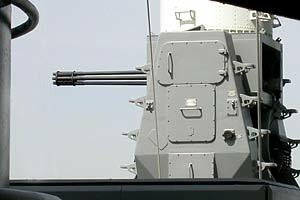 The battleship's main guns were test fired with the muzzles of the gun barrels a bit too close to the shack. The side of the shack is buckled in from the shockwave of the muzzle blast and you can see the outer dent and the cracking it caused to the interior of the maintenance shack (have a look at the Aft Deck gallery to see photos of the blast damage). 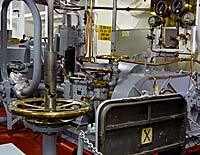 Dave said that all crew personnel were cleared of the decks before the main 16 inch guns were fired. He also told us of the single casualty the this battleship had in wartime. The ship was off the coast of Korea during the Korean War. 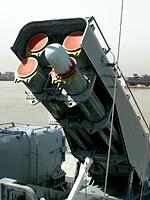 A North Korean artillery crew on the shore fired a round that impacted on or near the number 1 turret, killing a crew member who was on deck when he wasn't supposed to be there. When the ship returned fire the everything in the area where the artillery fire came from was obliterated and the firing from the shore ceased. 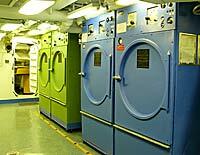 When I visited the USS New Jersey a second time in December of 2007 I was pleasantly surprised to find a number of new areas that had been freshly restored. 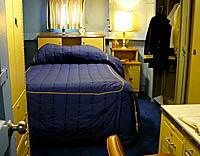 The battleship's barbershop was open for visitors as well as the brig and laundry areas. 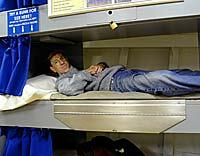 A lot of time and care had gone into the preparation and restoration of those compartments. Also there was a small commissary open where you could get a hot sandwich. I ordered a "pulled pork" sandwich. I was going to get something else, but two other staff members who had just ordered it said it was pretty good and they were right. I'd never had pulled pork before and it was very tasty. The commissary is in the galley area and prices were pretty reasonable. 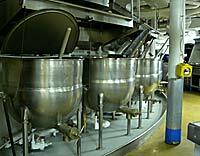 And you're eating in the galley of an actual WWII battleship! A couple of people have written asking why my photos didn't have the large awnings you may see at the forward sections of the battleship. Those are erected in the hotter summer months to give the volunteers some relief as they wait for and greet visitors boarding the ship. They are removed in the winter months so if you want to get shots of the USS New Jersey without them, go in the winter. Visitor traffic is very light at that time. Also the photo of the starboard side of the ship were taken from the early battleship Olympia museum across the Delaware on the Philadelphia side of the river. Even if it's a long drive for you if you're interested in Naval or Military history, set aside a day to make a trip down to Camden NJ to see the USS New Jersey. The ship is awe inspiring and the largest battleship on the east coast. The staff were very helpful and friendly too, and I was pleasantly surprised by the food served on board (Having lunch on a battleship - how cool is that?!!). When you arrive at the waterfront, parking is located at a parking garage next to the Camden Aquarium. Although it is about a third of a mile from BB-62, there is a shuttle bus continually going from the parking garage to the museum's visitor center. If you're physically capable, I'd recommend walking from the parking lot to the wharf. That way you'll have more time to let how big this battleship really is soak in. Take a trip down there. You won't be disappointed. 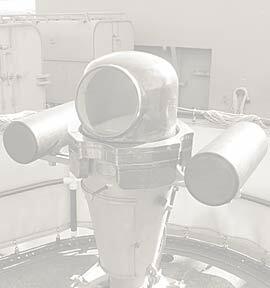 USS Iowa Veteran David Henry has put together a good USS Iowa Website with details and photos of his service aboard the USS New Jersey's sister battleship. 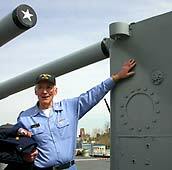 His page also provides news on the efforts to bring BB-61 to port near Los Angeles, CA as a WWII Museum ship. 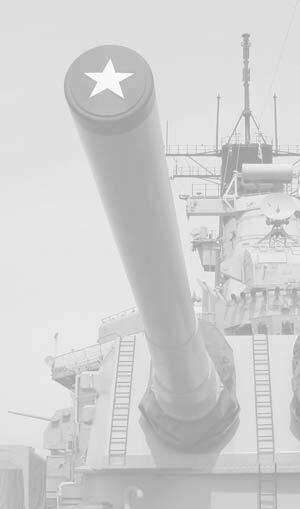 Here is an interesting Youtube video of a wartime training film for the operation of the Iowa Class Battleship's 16 inch guns. It gives good insight into the workings and manpower needed to feed and fire these big naval rifles. 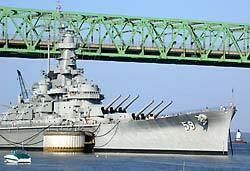 If you are a fan of battleships and you live up in New England and the USS New Jersey in Camden, NJ is too much of a trip for a day, pay a visit to the USS Massachusetts in Fall River, MA. It is not quite as well restored as BB-62 (although they are working hard on it), but it is a handsome ship and very historically significant having seen action throughout WWII in the Mediterranean and Pacific Theaters.